Catholics, time to brush up on things about your faith that you used to know — or thought you did? We walk into church and the first thing we do is reach our fingers into the Holy Water fount. Even better questions are, what benefit are we supposed to be getting, and, what are we supposed to be thinking about when we do it? Johan van Parys, a Minneapolis liturgist, has the answers to those questions and more. Folks who haven’t had any exposure to things Catholic will find explanations for everything from church architecture to garb, from gestures to sacraments. But if it’s been some good while since Sister Mary Whats-her-name taught us that blessing ourselves with Holy Water upon entering church is a reminder of our baptismal vows, that we are members of Christ’s church, that we’re entering a holy place, a different atmosphere than the rest of the world, then you’ll get something out of reading this, too. Like a good teacher, van Parys sets the stage for comprehension by helping readers grasp the concept that nonverbal communication and symbols touch us everyday. Body language, for example, flowers on Mother’s Day, a hug to a grieving friend. After that, the author is off and running, effectively quoting from the Catechism of the Catholic Church, the General Instructions of the Roman Missal, the documents of Vatican II and other authoritative works. There’s much to grab onto here, the what and why of vestments worn at Mass, the meaning behind the use of the various oils during sacramental rites, how sacred art can connect us to God and the saints, and of course, the superb symbolism of bread and wine. He’s unafraid to explain how some Catholic ritual evolved from pre-Christian peoples. And there’s a marvelous chapter on sacred architecture as symbol that tackles why our churches look the way they do and how they’ve changed through 2,000 years. The book is richer for the personal anecdotes van Parys relates: I loved the one about the choir members who tossed their coats casually on the altar only to have the pastor come by and sweep the coats off in one fell swoop! Each of the 10 chapters ends with a brief reflection and three questions to ponder and/or discuss. After reading “Symbols That Surround Us” I could easily see it serving as the text for a small group for a number of sessions and as the focus of an adult faith formation series. Those who facilitate gatherings for the Rite of Christian Initiation of Adults (RCIA) might find it a nice supplementary resource. But let me go back to my very first thought: I wasn’t halfway through “Symbols That Surround Us” when the lightbulb was turned on: I’d forgotten so many of these symbolic connections that enrich Catholic life. Reading van Parys’ little book will remind those of us in the over-50 crowd of some what we used to know — or at least had studied for the religion class test! Catholic and want to know more about Jesus? Ever felt uncomfortable discussing religion in a mixed-faith setting because you don’t feel you’ve really “kept up” with matters of faith? Paul Johnson’s brief (226 pages) easy-reading story of Jesus — subtitled “A Biography from a Believer” — will get you up to speed with some facts Catholics should know. It will also remind you what Christianity values and why you value your faith life. Johnson is an unabashed cheerleader for the faith, and he writes early on that he wants to share “the joy and nourishment” of following Jesus’ footsteps and pondering his words. Although I’ve read a lot of religious material, reading “Jesus” gave me a much better mental picture of the era in which he walked this earth, helping me place his life in the time of not just Julius Caesar but Ovid, Livy and Seneca, the Romans whose writing has put life in the Roman Empire into our hands. But I’d hesitate before giving Johnson my complete trust as a biographer or historian, and I think he’d find that perfectly acceptable. What these might very well be called would be “guesses.” Johnson says they are “mere deductive supposition.” When he describes Jesus’ appearance and the way he held himself, I’d call that analysis without basis of fact. Yes, Jesus did teach at meal time, but did he “love” to? But whether or not Jesus could recite Homer and Virgil is less important than the aura of Jesus that I think readers will get about the subject of this “biography.” You’ll meet a new Jesus here, one you’ve likely never thought about in the same way. Johnson offers us a pleasant, colloquial way of absorbing Jesus’ teachings in somewhat of a condensed version of the gospels, and he follows up by explaining why Jesus taught those lessons. The most useful section of the book may be Johnson’s explanation of why Jesus came and what Johnson charges might be a “New Ten Commandments” Jesus taught. You can see the list below, but it’s Johnson’s writes a page or more about each, and every one could serve as a homily worth hearing. 2. Accept and abide by, universality. Each soul is unique, but each is part of humanity. 3. Respect the fact that we are all equal in God’s eyes. 4. Love is a must in human relationships, at all times and in every situation. 5. We are to show mercy just as God shows mercy to us. 6. Keep balanced; don’t be an extremist. 7. Cultivate an open mind. 8. The pursuit of truth, unabridged, simple and pure, unstained by passion, is the most valuable of human activities. 9. Use power carefully, and pay due respect to the powerless. Can the writing style of a novelist get boring by just the third book? I’m sure Doubleday is going to sell enough copies of Dan Brown’s latest puzzler to wallpaper every monument and public building in Washington, DC inside and out. However. Although I really liked “The Da Vinci Code,” “Angels & Demons” wasn’t that good and didn’t hit the charts until Da Vinci made the author famous, and frankly “The Lost Symbol” got to be 500-plus pages to fight through. By chapter 126 I was struggling to stay awake, and there were seven more chapters and an epilogue to go. 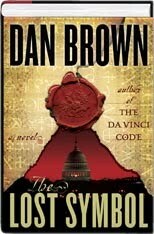 First-time readers of Brown may find the sleuthing of main character Robert Langdon fun to follow, but readers of Brown’s first two Langdon novels are likely to see the tramping about Washington in search of clues as formulaic — way too similar to the tramping about Paris and Rome in those earlier works. Throw in the usual gruesome deaths and violent tortures, Brown’s usual mysterious society — this time the Masons — and you’ve got your typical pulp novel. Of course that doesn’t make for a 500-page book, so Brown does readers the real disservice of going way too deeply into explanations about ancient philosophies, symbols, religions, languages, sciences, archeology, plus off-the-chart mind-over-matter silliness, all of which seems like filler in what should be an action-packed story. Brown does his best to work in subtle jabs at the Catholic Church in particular and other faiths as well, questioning the veracity of truths they teach in some cases, in other times bluntly alluding to what he paints as errors. Really Mr. Brown? Two sources I read credit the British press — not “the church” — with calling Crowley “The Wickedest Man in the World.” And your brief reference to him as “a visionary mystic” hardly do justice to the depraved person Crowley was. Minus the overbearing scientific explanations and the graduate-school lessons in antiquities, “The Lost Symbol” might almost be a decent page-turner of a story. But then Brown succumbs to the temptation to get preachy. Bishops are people, too! Who knew? 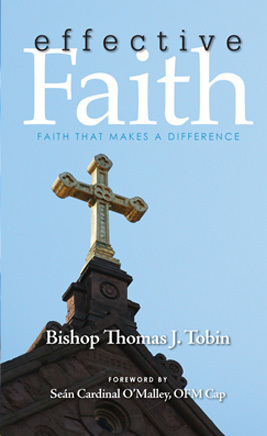 I’ve just read Bishop Thomas Tobin’s book for the second time, and I liked it just as much as I did the first time. I’d only spent a handful of hours in the bishop’s company a few years ago, but I was invited to read a proof of a collection of newspaper columns that he’d written for diocesan newspapers in Ohio and Rhode Island. I added at the time that this collection of columns deserves a wider audience, and I’m glad that Seraphina Press from Minneapolis has made that possible with this easy-reading, 175-page paperback. What the bishop does best is take the news of the day — the topics real people are talking about — and make them the perfect subject matter to grab readers’ attention and engage them in the lessons that life keeps teaching him. That means writing about sports, about casinos, about how life changes, about all the “stuff” in his life and ours and the need to get rid of some of the baggage. One of my favorite chapters is “The Gospel at 30,000 Feet,” where he describes getting the third-degree about the church from a non-Catholic seat-mate on an airplane. The questioning is priceless! There’s a beautiful chapter about his interior thoughts as he held the baby he’d just baptized and pondered the world she would find on her journey. “Ashley’s World” lets us all into Bishop Tobin’s world, if you will, and the questions we all have about what the future holds. The chapters are short, worth savoring one a day for 40 days, worth reading and spending time reflecting on our own view of life, faith, the issues of our day and our own little world. Talk around the dinner table? It’s in the cards! So you want to have more meaningful conversations around the dinner table, something to counter the gobble-up-and-scatter tendency in too many of our homes? You love your faith and you want your children to love it and to grow up with the values you cherish, but you could use some tips on ways to do that without seeming like you’re always preaching? “The Meal Box” is there for you. A product of Loyola Press, “The Meal Box” is being plugged as “fun questions and family faith tips to get mealtime conversations cookin’.” It’s all that and more. Packaged like a deck of playing cards, it’s a plastic box with 54 cards, each containing a question that will get just about any age-group talking at suppertime. When it comes to things that make you really happy, what five things would you rank at the very top? Suppose you were told that you could have one wish come true — but the wish you make would have to be for someone else, not for yourself. What would you wish for, and for whom would you wish it? If you could have 100 of anything right now, what would you choose? When asked what it would take to get to heaven, Jesus said, “Feed the hungry, give drink to the thirsty, and clothe the naked.” That’s what parents do each day. It’s a paradox that our greatest happiness comes when we freely give of ourselves. Think about that the next time you’re fixing supper or folding laundry. Empathy is a fundamental building block for all moral growth. Make it a family value to frequently consider how your behavior and choices affect others. When your child talks about other children’s experiences, gently ask, “And how do you think he/she felt about that?” This will nurture your child’s capacity for compassion. One task of parents is to help their children develop the skills of discernment — that is, to make wise choices. This is better taught through example and be establishing limits than by coercion and criticism. “The Meal Box” questions are such a painless way for parents to connect with their children, to enrich family-time, and to counteract the tendency for family members to do their own thing and go off into their own little worlds. The younger ones may even forget about whose turn it is to play Wii. Teens may pull the iPod earphones out for a few minutes to chime in with their thoughts. For purchase information, go to http://www.loyolapress.com. You could read “A Guy’s Guide to the Good Life” just for the volume and variety of quotations worth remembering, but Bob Lockwood’s sometimes hilarious, always thought-provoking guys tour through prudence, fortitude, temperance, justice, faith, hope and charity digs so much deeper than that. Lockwood’s brief, 140-page Servant Books paperback might accurately be described as something your father would have written if your father had written down all the things he wanted to you to know and remember. It’s a genuine service Lockwood performs, given that many fathers aren’t/weren’t the gifted writer this long-time columnist for Catholic publications is, and given that so many men tell anecdotally about how little their father ever verbally communicated — with them or anyone else. Lockwood pinch hits for dad, passing on soothing-yet-challenging drops of wisdom through stories, most with a Catholic angle, many with a sports angle, often accompanied by a cold beer. And Lockwood is anything if not a truly gifted storyteller. A Catholic writer who quotes Meatloaf? Along the way he quotes men whose words are worth recalling, mixing Charles Dickens, St. Paul, John Lennon, Benedict XVI, Dante (perhaps more than one might care) and John Paul II, among the names you’d recognize. Pop music plays in the background, with lyrics by the Beatles, Skeeter Davis, and Meatloaf helping make his point. Lockwood even manages to channel Cat Stevens. It all works, though, to base his — well, it’s teaching, when you come right down to it — in a real world, a world in which Lockwood has lived some 60 years and thinks what he’s learned in that time is worth sharing for our benefit. Throughout he pesters guys with the thought we can be more — that a virtuous life isn’t too difficult to achieve.